Paul Black took over the reins of electronic health record vendor Allscripts Healthcare Solutions in 2012 after 13 years with rival Cerner Corp., where he rose to chief operating officer. 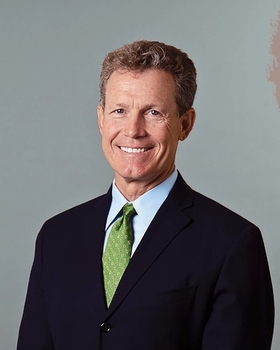 In between, he spent five years with a private equity firm, which served him well in the past year as Allscripts acquired firms with software offerings that go well beyond its mainstay physician office business. Editor Merrill Goozner recently spoke with Black, 59, about his strategy for Allscripts and the future direction of the EHR business. The following is an edited transcript. Modern Healthcare: What was behind your recent moves into home care and behavioral health EHRs? Paul Black: It's very important to be relevant to our clients' needs. By that I mean, you can be a really great electronic health record company, but if you're not helping companies make the transition from fee-for-service to value-based care, you're not going to be relevant. We have four different platforms: EHRs, population health, consumer engagement and precision medicine. Those are important distinctions for where we are in 2017 from where we were in the past. We have made acquisitions, but for the most part, we've built those platforms through growth and in our own engineering divisions. MH: Where are you still looking to beef up your offerings? Black: On the inpatient side and hospital side, it's important to have an integrated platform—from the ER to surgery to pharmacy. Both acute care and ambulatory care have to be on one platform. That's the bulk of what's been done over the past four years. We have a complete suite of offerings. On the ambulatory side, we have revenue-cycle capability, documentation and the rest. MH: Do you see yourself competing with startups or are you open to collaboration? Black: We've had an open approach to all outside parties. Very few have done that until recently. We embrace third parties; we embrace startups. We have over 140 companies that have signed on to the Allscripts developer program. They come in; learn how the API (application program interface) works; they get certified; and they have access to our EHR record to build solutions on top of that. We have 40 people inside Allscripts to help those folks be successful. It's one thing to publish an API. It's another to help train them for the solutions they're building. In 2013, we had an application development program contest. We gave up to $1 million to four companies. They competed and were chosen as the four best. We collaborate with (Chicago-based) Matter. We helped that incubator get started. At last count, there are more than 2,000 programmers writing code on top of Allscripts' solutions. We think that's a distinct competitive advantage. MH: What's your approach to interoperability? Are you building a closed system with your acquisitions? Black: Our approach has been to build the foundation for a second layer based on population health management. It's based on the availability of an interoperable platform. It has to have three or four distinct capabilities. We have to pull data out of any EHR out there. We have 450 systems homegrown that we pull from today. We harmonize it for the different nomenclatures used to describe different medical conditions; different documentation capability; medication terminology. We harmonize that and put it into what we call a single source of truth. I store it, and then I give people the capability to perform analytics around that so they get a full understanding. We perform the analytics, or we help them do the analytics. We want to close the loop back into the source EHR, whether it's Cerner, Epic or Allscripts. From a consumer standpoint, if you're a physician, this data has to be presented to you in the workflow of your practice. I just want to see what's relevant to this patient in front of me. This is why we believe our population health layer, our interoperable layer, is more robust and has better outcomes for our large clients. MH: Who's a major client who has used your platform in that way? Black: Baylor, Scott & White Health in Dallas. They have six different health plans they work with, one of which is owned by Baylor; they have 50 different electronic health record systems. They have the Allscripts system in the Dallas area and further south they have Epic. The platform sits on top of all of those EHRs and does the connections, the harmonization, the analytics, and the transactions that are created to go back down to 50 systems. MH: What will be the big issues at HIMSS this year? Black: Interoperability continues to be the big issue. There's been a fair amount of automation, but as a consumer, you're not able to get your own data. It is crucial to care coordination, which is a subset of population health. How do I handle a patient in the ambulatory, acute and post-acute situation? How do we manage patients as they go from organization to organization? There will be a continued focus on the consumer, with cool apps that people are building to live on top of the basic EHR framework. In the past three years, we've finished paving the interstate across the entire U.S. Now lots of people are going to take advantage of that digital framework. The other theme we're working on is precision medicine. We combine information that comes from sequencing machines with information from the EHR on family history, current meds, their conditions. How do you manage the phenotypic information to build the absolute best, most precise protocol that would give the best outcome for that particular human as they're dealing with a serious illness? MH: How does the partnership with Nant fit in? Black: We have a way to identify which patients should be sequenced and to figure out how to translate that into a protocol based on that information. There's a fair amount of intellectual property we've developed that will make that workflow more usable, not only by large academic medical centers, but for the large ambulatory population of clients that we have. We want to make that new science available to folks not just in large populated areas, but in Des Moines, Cedar Rapids and other places across the country that haven't historically had a 30-story academic medical center. MH: Is this strictly about cancer? Black: The moonshot is about compressing the time between discovery and the clinic. That involves the National Institutes of Health, the Food and Drug Administration, drug companies … to help find patients more expeditiously for clinical trials. It's a pretty broad collaboration. The price of sequencing coming down has created the energy behind the cancer moonshot. We think capabilities are here today that weren't here three or four or five years ago. The FDA says we're very interested in helping you with smaller trials. But we want to make sure that we get this out to middle America, to rural America as quickly as we do to Dana Farber. How do we close the loop for people in rural areas who should also have access to these new medical protocols? We have a huge primary-care network—45,000 physicians spread out across the U.S., mostly in four- to six-doc practices. That's where we can get the identification and surveillance of some of these rare diseases. They couldn't afford the three- or four-hour car ride to go to participate in a clinical trial. I don't think it will be solved overnight. But if done correctly, it can have a very broad impact. MH: What impact will the political change in Washington have on the health IT world? Black: Anytime there is a change, there's a chance for new legislation, just as when the last new administration came in. The Obama administration focused on the stimulus act, which created an important construct around digitizing the entire healthcare system. I hope they continue focusing on cancer, on precision medicine, which are natural stepping stones once you've got the interoperability done, once you've got the consumer connected. I'm sure the MACRA rules will stay intact. We don't see that slowing down. MH: Will MACRA implementation boost your business? new clients. We will actively pursue that business as well. MH: You've bet big on population health management. Yet new HHS Secretary Tom Price seems to emphasize physician autonomy. Black: He will make sure if we add more regulatory changes to the workflow, we'll take time to understand what impact it will have to their practices. My crystal ball says there will be more practical testing before we make it mandatory. He's going to try to do everything he can to minimize the work impact to the physician community. Paul Black is the CEO of Allscripts Healthcare Solutions. An earlier version of this story used an incorrect title for him.